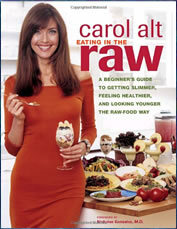 Eating in the Raw was written by supermodel Carol Alt who was once called one of the most beautiful women in the world. Now in her late forties she claims that she is at the healthiest, slimmest and most energetic that she has ever been due to changing her lifestyle to adopt a raw food way of eating. After years of yo-yo dieting left her suffering with illness and mood swings, Alt decided she needed to take action. She embarked on a raw food diet under the guidance of naturopathic physician Dr. Timothy Brantley. Alt describes how she achieved relief from a range of symptoms including fatigue, chronic headaches, sinusitis and digestive disorders by adopting a predominantly raw food diet. She wrote her book as a guide for beginners who wish to find out more about this style of eating. In line with the raw food philosophy Alt puts forth the concept that cooked foods are not what our bodies are designed for and that when we consume them they can cause addictions to unhealthy food and poor general health. Dieters are advised to eat at least three meals daily without calorie counting or portion control but rather to as many eat raw foods as they like to the point of satisfaction. Each meal should contain a variety of raw foods and should include healthy fats, proteins, and carbohydrates. There are no recommendations given regarding alcohol consumption as Alt gave up alcohol when she commenced her raw food lifestyle. Carol Alt’s diet is not a 100% raw food plan, as she allows for the incorporation of some cooked food, however, she advises that most foods should be consumed raw. In contrast to most raw food diets it is not a vegan diet plan as raw dairy products, along with eggs, fish, and meat are allowed. Eating in the Raw retails at $16. Alt has also published a recipe book called The Raw 50, which retails at $17. If dieters wish to create the recipes in the books it may be necessary to purchase a range of special equipment including a blender, juicer, coffee grinder, food dehydrator, vacuum storage machine and thermometers. Promotes the intake of fresh fruit and vegetables. Avoids the rigidity and nutrient deficiencies that are often associated with strict raw food vegan diets by allowing the inclusion of raw cheese, eggs, fish, and meat. Does not require calorie counting or portion control. Does not eliminate entire food groups. Includes many tips that can help dieters new to a raw food style of eating. Promotes health over weight loss as a motivation to adhere to the diet. Alt has a down to earth writing style that many readers will relate to. Very restrictive and will require major restructuring of the diet for most individuals. Dieters may experience quite severe detoxification symptoms if they are not careful to gradually transition into the diet. The safety of consuming raw animal products is questionable. If handling and storage is not impeccable there is a risk of exposure to dangerous bacteria. There will be an increased requirement of time spent on meal preparation. Many of the recipes include unusual or difficult to find ingredients and may require expensive kitchen equipment. Lacking guidance regarding meal planning. It is important to remember that just because the diet worked for Carol Alt this does not necessarily mean it is the best diet for everyone. It is not surprising that Alt experienced tremendous changes in her health when changing her diet to include fresh and nutritious foods after years of disordered eating patterns and an excessive intake of alcohol and refined carbohydrates. While many people do report incredible health recoveries on a raw food diet it is important to be cautious with Eating In the Raw. Almost everyone will benefit from an increased intake of fresh fruit and vegetables however not all dieters respond well to a strict raw food diet as a lifestyle eating plan. actually you can be a raw vegan. that’s a thousand times better and requires no ish. i have felt so much better about my self sense i have been on this diet did you know taylor swift is also on this diet! hi there could you e mail me a diet that does not have carbs just a little carbs and no sugar do you have a menue. Catchy, read that line again, it says “In contrast to most raw food diets it is not a vegan diet plan as raw dairy products, ALONG WITH eggs, fish, and meat are allowed.” Along with, denotes the fact that eggs, fish and meat are not considered dairy. When did eggs, fish and meat become dairy products?